LOVE the layout of this fun card - thanks for the inspiration !! Pure simplicity! Just stunning and fun! Great kit!!! Super fun card! Thanks for the inspiration. Really like how clean and simple you made the card by doing the plain white bottom with the black embossed top panel. Love the look! 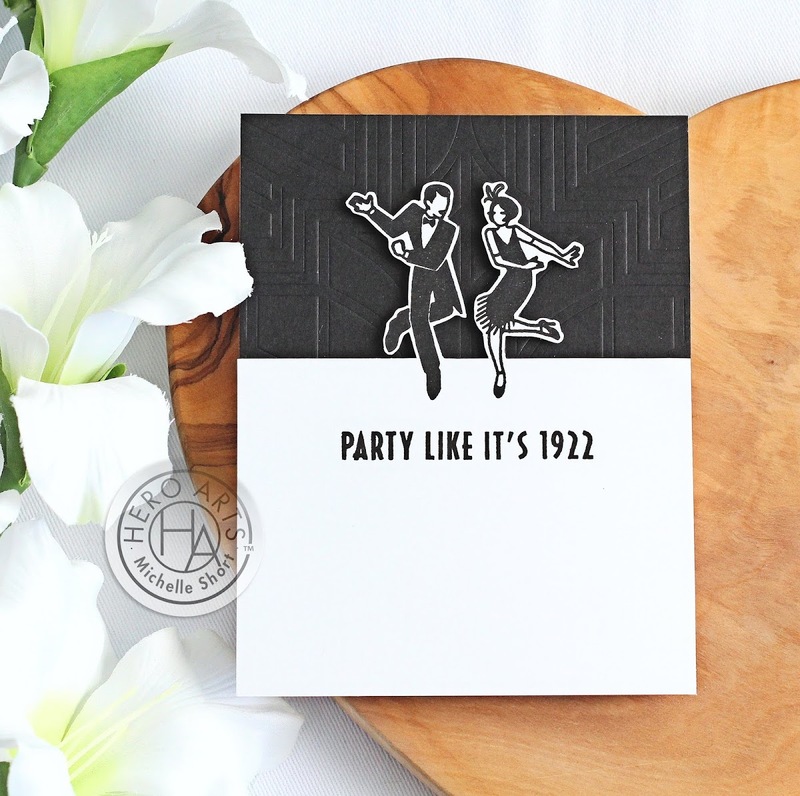 I love black and white cards - very classic! So fun and classy! I love how you partially cut them out! What a cool kit! You put us in a party mood! Love this set! TFS! Cute. I love how you used just black and white in your design. The embossed background really stands out. 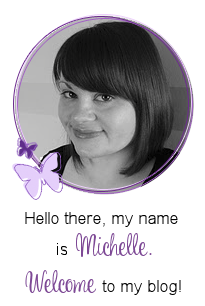 Michelle, your card is very pretty. I like how you used the stencil to emboss. Thanks for sharing. Love your card and these 2 partiers are my favorite dancers in the entire set! They are truly the "bees knees." What a fun kit and cool card. Clean and simple is the bees knees! Clean and simple can be so elegant! I absolutely love the simplicity of this card. It is really a great contrast with only black and white. I love the textured top of card! The black and white palette matches perfectly with the style of this fab kit. Thanks for sharing your creativity. A great card! I love the background. I love to see products used different ways, to use the stencil as an embossing plate is wonderful. I really like the various different products in the kit. So different and versatile. Such a fun card! Great kit! very beautiful, simple and basic , I reallly like it!! Your card is so stunning! And this kit is just delicious! So simple, yet so elegant, love it! I love how you used such a busy kit to make a clean and simple card! Fantastic idea. What a great way to make a simple and clean card! Thank you for the opportunity! I love it! So simple looking but very striking! Simply elegant! 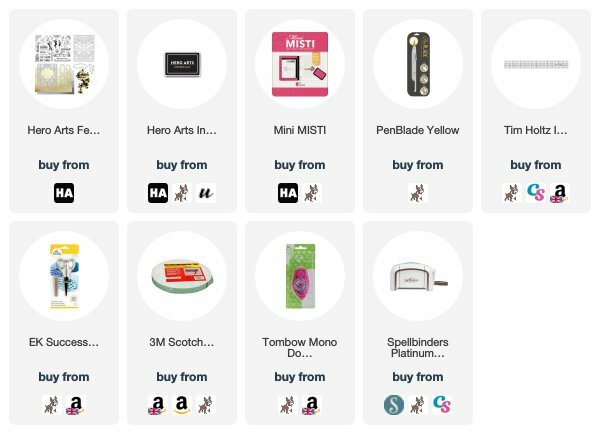 Love your card and this awesome HA kit. TFS! Wow, this black and white card makes it look even more retro, I love it. What a pretty card! I love the black and white contrast and this kit! What a super elegant & sophisticated looking card just like the era was, you've done a fabulous job. Thank you so much for sharing your ideas. Stencil and die in this kit are awesome....nice card!!! Love the simplicity of this awesome card! This kit is wonderful & so are the add-on goodies. This design is perfect & love how you fussy cut the figures. I like the use of the stencil as an embossed background. I wouldn't have thought of that. Cute card! 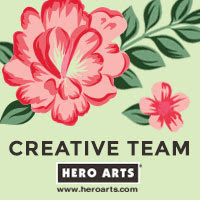 Can’t wait to get my Hero Arts monthly kit, love this retro look. Love your CAS card. Love they way it came together. cute card, Michelle! such a fun kit this month! I love your fun card. The kit rocks. Just lovely. Wonderful and classy. What a cool card! It's classy and funny at the same time, coolio~! A simple yet elegant card - great job! Very creative use of the Art Deco die asa stage curtain. Gorgeous card! Love the black and white. Nice card design - I love the tone on tone texture of the upper panel. Like the clean look here. Simple but stunning! I really like the black and white of this card, that sentiment just cracks me up. Nice clean and simple card. I like the way you used the stencil. Fun design. I like the embossed panel. 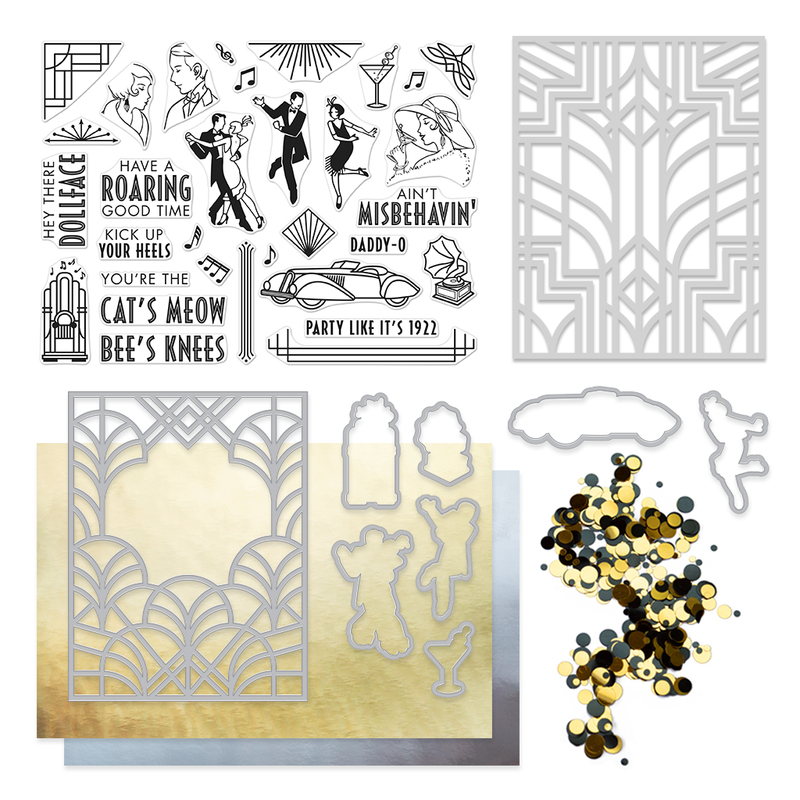 what an elegant & fancy looking card ♥ this art deco kit is just fabulous! I'm sorry I missed out on that era. seemed to have a lot of fun. Awesome new Kit, I love the Art Deco style! Gorgeous creation! Your card looks great! I'm not sure I could fussy cut that well but you did a great job. Love the CAS look. Your card is beautiful! I love those dancers! This is such a gorgeous kit! Thanks for the inspiration! Nice simple, black and white! 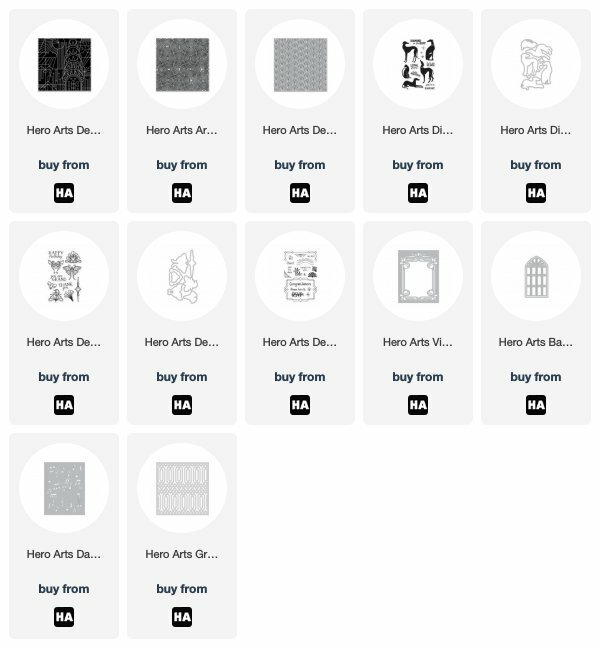 I am excited about the potential this kit offers to make cards for so many occasions. Inspiring! I love the colored images in your cards! 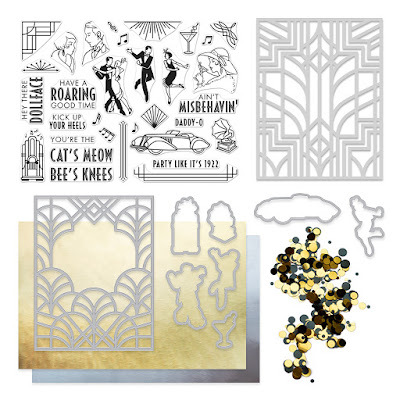 Love your elegant card made from this awesome kit! Fantastic CAS card! Love how you kept the dancers part of the bottom panel by trimming around them. So fun and playful! A very clever and eye-catching card, Michelle! It really shows off this wonderful new kit! Thanks so much for sharing your wonderful inspiration! 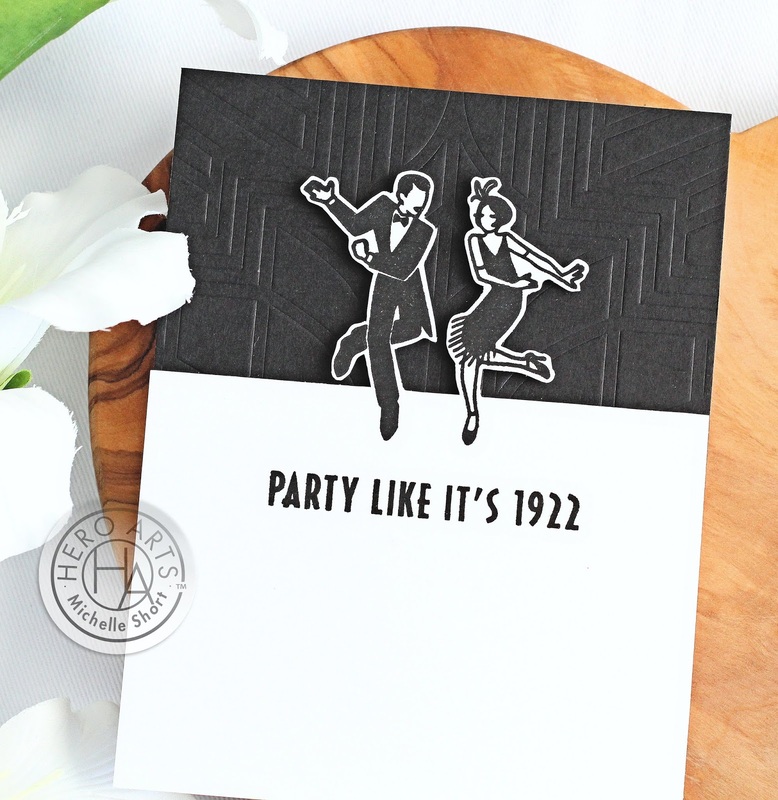 Great card - love the idea of embossing the stencil for the background! A simple design but a very striking card! Very cool card! I love the black and white together, it's so elegant! Hi Michelle, I am late to comment but just got back home from travelling. My Hero Arts kit had arrived while I was away so I wanted to look at the inspiration and I must say that I just love your classy card!